“I’ve not been there since the burial, four months ago. I can’t, I almost cried just now, but I need to be strong, I need to be a strong woman,” said Victoria Tagbayoung. We’ve just been to one of several burial sites dotted around the outskirts of the town and now we’re heading back. The town itself is made up of a mixture of beautifully constructed mud houses each with its own small garden. Clothes are drying outside laid on the grass, or placed gently on the wooden rooftops. Women are cooking lunch, children are gathering around us, eager to know why we are there. You wouldn’t think that just four months ago, they buried the town’s 39th victim of the Ebola Virus Disease. “Everyone knows someone who died,” said Victoria. On September 3, 2014 a young man came to Mawah from Kakata, a nearby town. “He was sick,” said Victoria. 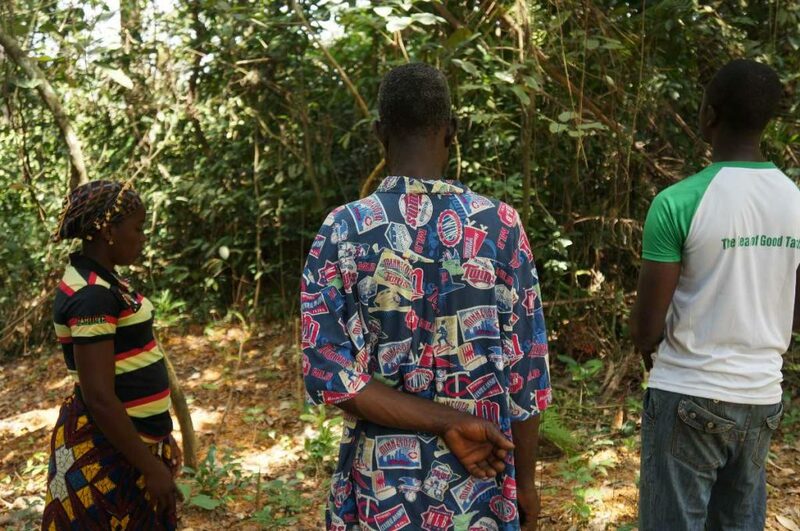 He was travelling to Bong Mines to see his mother, but he had been brought to Mawah because the town has a doctor who can give Liberian medicine. The doctor asked him how long he had been sick, but before he could answer he had collapsed. “We didn’t know it was Ebola,” said Victoria. “We just heard it on the radio, but it was not really clear to us at all,” she said. Some people started rubbing medicine on the man, then they carried him to a house and he slept. The next morning he was vomiting, he had a fever and diarrhea. He was taken back to Bong Mines, to his mother – within hours, he was dead. From September 4th to 17th, people in Mawah started to become sick. On September 17th, Ebola took the town’s first victim. Between September 17th and October 10th, 39 people from Mawah died from Ebola, only 7 of those infected survived. The town was quarantined for almost two months. Decisions to quarantine areas have brought extreme hardship to more than a million people during this epidemic – but they have been essential for containment. Containment was necessary for those outside Mawah, but within, the pain and suffering was palpable and remained even months after the end of the quarantine. Dr. Friederike Feuchte, International Medical Corps’ Mental Health and Psychosocial Director, was one of the first to be alerted to the situation when she visited Mawah in December 2014. “They were very friendly, very open but you could also feel they were somehow stuck,” said Feuchte. “We had this workshop where we basically asked people from different communities, ‘What do you really want for your community to help you move on now?’” she said. 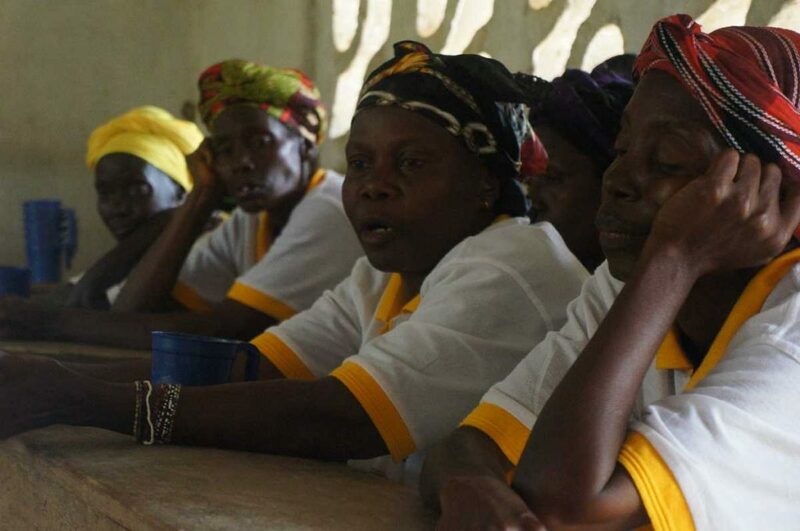 The people in Mawah chose counselling as a tool to try and work through the pain. And so it began. Meetings that started with a handful of women talking about what they wanted for their community have grown into group counselling sessions.Now, around 70 people attend the four coordinated and specifically structured group sessions held in parallel each Saturday by International Medical Corps’ team of psychosocial workers and social workers from Bong and Margibi County. “There’s a lot of broken relationships because of Ebola, there’s a lot of grieving, there are some conflicts, and people are missing, so the social structure is disrupted,” said Feuchte about the situation in Mawah. “Re-connecting with each other and rebuilding relationships, building trust and finding a way to move on is something that needs time and needs work,” she said. Mawah, early Saturday morning – already the town is a hive of activity, women are cooking breakfast on the fires outside their homes, children are running around playing, they come to greet us as we park the car, they recognise who we are and wave. We unload the goods from the back of the vehicle. We’ve brought rice, cans of drink and bags of lollipops, some of the ladies in the town will prepare a huge feast for everyone at lunchtime – as for us, we head off to the town hall, a focal point for gatherings and the setting for International Medical Corps’ Saturday meetings. As benches are organised around the large open room, facing the concrete stage, women who have already arrived start clapping and singing. Men and women from the town slowly trickle into the hall and find a place to sit. There’s more singing and dancing. An old man, easily in his 70’s kicks off his battered worn out shoes and steps into the middle of the floor, pauses, then begins dancing, releasing what could be months of built up frustration, anger, sadness – who knows, but he looks so happy. After a minute or so, he walks over to another person, and where once, they may have shaken hands, they now touch elbows – a technique used by many in West Africa to exchange greetings. The singing and dancing is a way of celebrating life in this relatively small community, before they begin the more somber part of the session. 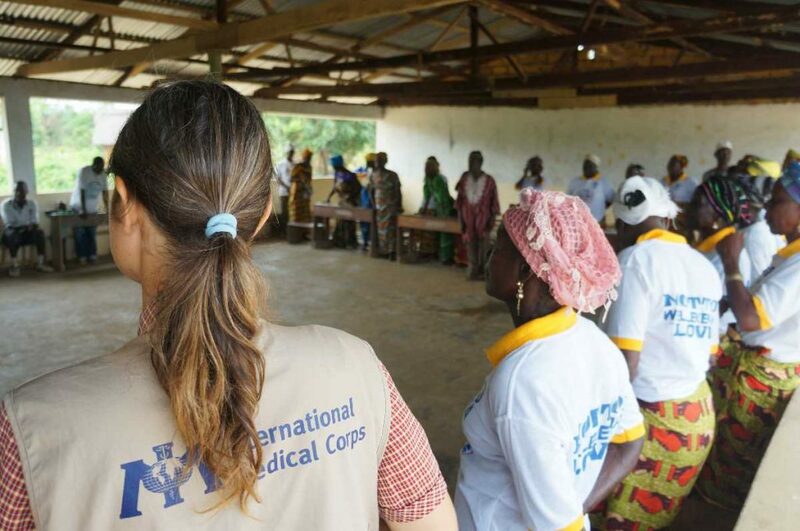 Before they break off in to the four smaller counseling groups, they want to give thanks to International Medical Corps. “Our own relatives were afraid of us, our own people neglected us. Then International Medical Corps came to help,” said one man, standing to make himself heard in front of the 70 strong crowd. “If Ebola enters in the home, it will destroy the home,” said another man. “We are learning from you people in case Ebola returns,” he added. “There was hatred and division amongst members in the town, but because of International Medical Corps, those people are now friends,” said the Imam of the town. One of the smaller groups stays in the Town Hall, one heads for the church and two go to the local schoolhouse that remains shut to pupils. I head to the schoolhouse and join a group of 16. Behind me on the board, a teacher’s notes on fractions and algebra are still there in black and white – but these students who are in this room now are not interested in math, they’re all eager for the healing to begin. “We all in Mawah, we are one family. If it happened to one, it happened to everyone. There is so much hurt in our hearts. Ebola has taken everything away,” said another. A woman who was sitting next to me said she had fled into the forest from the town when Ebola had struck. “I decided to pack my things, take my children and grandchildren and run away into the forest to pray,” she tells the group. “Why?” asks Garmai A Cyrus, International Medical Corps’ Psychosocial Officer. “Why did you not stay?” Cyrus asked. “I am afraid, afraid of Ebola. It will get us and kill us,” she says. Without saying a word, the rest of the class nod in agreement. Another woman who spoke of her ordeal said she had been so happy because her children had graduated. Now, Ebola has taken her children, she has nothing. She sat and cried. The class fell silent. Over the next three hours, I sit and listen to so many stories, stories I couldn’t even imagine, stories of absolute gut-wrenching sadness and loss. 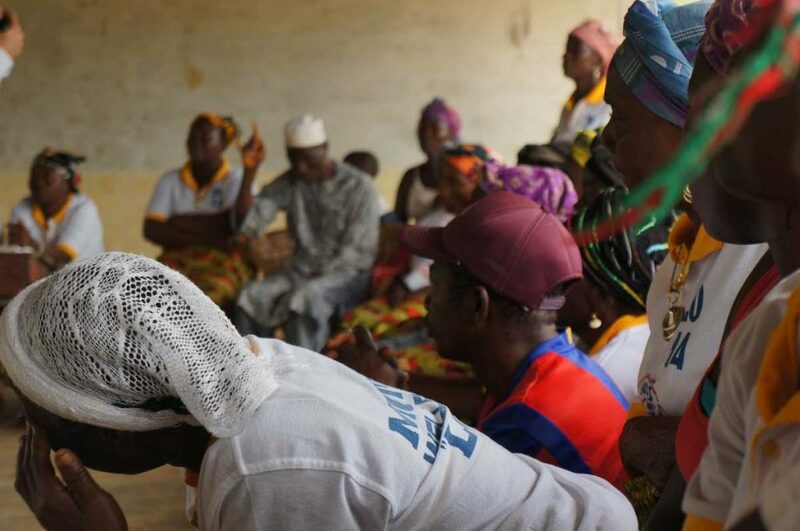 But the group sessions are not just for talking about Ebola and its effect on the town, they are about forgiveness and working together as a community to overcome and move on. “More difficult points came up with these conflicts between the group members, the anger that was there, this not being able to forgive, and blaming other people for not having helped or not having been there,” said Feuchte. During the meeting I heard a story of one woman who blamed the friend of her son for not being able to get to him when he was sick. The child was on one side of the river, and the friend would not transport him back because he was afraid of the risk to himself. Another story told of the fear of helping others whose family members had died. “The person lost the children and no one was around her to comfort her or to help her with this grief, but rather everyone was going away and saying she has Ebola,” said Feuchte. There are women who have turned to drugs as a coping mechanism. Some have started drinking heavily. I visited the gravesite of a woman who had lost everything. She had lost children, grandchildren and her husband. She had no one left. She herself had turned to drinking to try to cope with the loss. “They are forever gone,” she said, speaking about the dead. But Mawah and its people are still there.